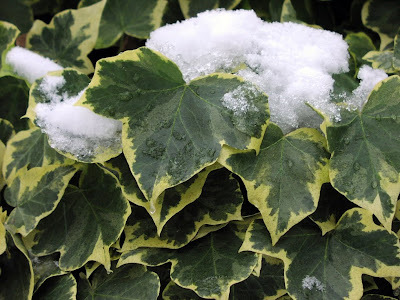 Ivy, Holly's co-star in the carol The Holly and the Ivy, is one of the evergreens traditionally associated with Yuletide. The carol is also unusual in that it contains both Christian and Pagan imagery, with holly and ivy both representing Pagan fertility symbols. Ivy stands without the door, she is full sore a cold." However, as I pointed out last year, that is a little ironic because only female holly bushes have berries, the male bushes are quite plain. So maybe the women are secretly getting the last laugh in that contest after all. According to Cunningham's Encyclopedia of Magical Herbs, ivy is associated with Saturn and Bacchus. Both of these deities were honoured by the ancient Romans with festivals at around midwinter. Worshippers of Bacchus and Dionysus carried a thyrsus - a staff wound with ivy leaves - in dances to honour their god. The staff is thought to represent the male while the ivy symbolises the female. In magic, ivy represents fidelity in love. It can be used in love charms or carried by brides as part of their bouquet for good luck in marriage. If ivy grows around your house it will protect it and all who dwell within from adversity. Huh, I guess it makes sense from a misogynistic point of view, with ivy being "clingy" and unable to stand on its own without support. Not to mention holly's prickliness.